As conditions settled in the global financial markets, lowering uncertainty and volatility to post-crisis lows, and the Queensland Government continued the implementation of its primary fiscal objectives, Queensland Treasury Corporation (QTC) successfully funded the State’s borrowing program, contributed to many of the State’s priority projects, and provided significant whole-of-State benefits. The Queensland Treasury Corporation Annual Report 2013-14 provides details of Queensland Treasury Corporation’s (QTC’s) achievements, outlook, performance and financial position for the 2013-14 financial year. As the Queensland Government’s central financing authority, Queensland Treasury Corporation (QTC) plays a pivotal role in securing the State’s financial success. With a focus on whole-of-State outcomes, QTC provides a range of financial services to the State and its public sector entities, including local governments. These services include debt funding and management, cash management facilities, financial risk management advisory services, and specialist public finance education. QTC borrows funds in the domestic and global markets in the most cost-effective manner and in a way that minimises liquidity risk and refinancing risk. QTC achieves significant economies of scale and scope by issuing, managing and administering the State’s debt funding. QTC works closely with Queensland’s public sector entities, including local governments, to assist them to effectively manage their financial transactions, minimise their financial risk and achieve the best financial solutions for their organisation and the State. QTC assists the State’s public sector entities to make the best use of their surplus cash balances within a conservative risk management framework. It offers overnight and fixed-term facilities and a managed short-term fund. collaboration with the financial markets and private sector institutions. QTC offers a range of education and training courses that complements its products and advisory services and allows it to share its specialist financial, commercial, treasury management and risk management expertise with clients. Courses are developed and delivered by QTC’s experienced professionals and industry experts. I am pleased to present the Annual Report 2013-14 and financial statements for Queensland Treasury Corporation. A checklist outlining the annual reporting requirements will be available on our website immediately following the tabling of this report in Parliament. Buoyed by lower levels of volatility in the financial markets and the State’s progress towards fiscal reform, 2013-14 saw QTC bond spreads compress to pre-financial crisis levels for short- and mid-curve bonds, with a number of new investors attracted to QTC bonds. QTC raised $11.1 billion to fund its borrowing program with the launch of a new 2025 benchmark bond in April 2014, and two benchmark-sized floating rate notes with maturities in 2016 and 2017, and driven by investor demand. This was supplemented with short-term issuance, which was maintained with an average of $5 billion on issue throughout the year. On the cash management side, QTC’s Capital Guaranteed Cash Fund outperformed its benchmark, the UBS Bank Bill Index, by 0.80 percentage points and was ranked first in the CPG Research & Advisory Pty Ltd performance report, providing QTC’s clients with strong returns. QTC’s long-standing commitment to openness and transparency continued, with its investor relationship program delivered in partnership with the domestic and global banks of its Fixed Income Distribution Group to enhance existing market relationships and attract new investors. For the 2013-14 year, QTC recorded an operating profit after tax from its capital markets operations of $119.2 million (2012-13: $222.9 million) primarily due to fair value accounting gains associated with the management of QTC’s funding task and balance sheet. QTC borrows in advance of requirements to ensure public sector entities have ready access to funding when required, to reduce the risk associated with refinancing maturing loans, and for liquidity management purposes. As a consequence of market changes, realised and unrealised accounting gains or losses may be recorded during the year which, depending on whether these transactions are held to maturity, may be reversed in subsequent accounting periods. Separate from QTC’s capital markets operations, the long-term assets operations recorded a profit of $3,128.0 million (2012-13: $990.3 million). This segment comprises the investments that fund the State’s defined benefit superannuation and other long-term employee obligations. Managed by QIC, these obligations were transferred to QTC by the Queensland Government under an administrative arrangement in 2008; in return, QTC issued the State with fixed-rate notes that provide a fixed rate of return. While QTC bears the fluctuations in the value and returns on the asset portfolio, there is no cash flow effect for QTC. Any losses incurred by this segment have no impact on QTC’s capital markets activities or its ability to meet its obligations. enhancement of the financial and risk management capabilities of Government agencies through a range of education and training initiatives. In the year under review, QTC prioritised the delivery of its collaborative, value-adding assignments for the State’s public sector, increasing the breadth of assignments and agencies. Assignments helped deliver cost-effective social housing and public schools; assess EOIs for several major developments; plan for the introduction of the NDIS; and support councils to deliver financially sustainable services to their communities. The positive outcomes generated by these activities saw a continuing lift in clients’ sentiment towards QTC and perception of its ability to add value through advisory work. QTC farewelled two Board members—Neville Ide, whose resignation was effective 1 July 2014, and Gillian Brown, whose resignation was effective 21 August 2014—with best wishes and sincere thanks for their significant contributions to QTC over the years. In 2014-15, with its talented and committed staff, QTC will make the most of the global opportunities for bond issuance to cost-effectively fund Queensland’s infrastructure requirements; maintain its operational focus on improving efficiency and ensuring prudent risk management; and continue its partnership with Government to deliver fiscal reform and secure the State’s financial success. In 2013-14, QTC raised $11.1 billion to fund the State’s borrowing program. The borrowing program was reduced by $1 billion following the Government’s mid-year fiscal and economic update in December 2013, as a result of better operating performance in the general government sector, lower borrowing requirements across Government, and the deployment of surplus liquidity. The majority of term debt funding was raised through public issuance using a variety of methods including syndicated primary transactions, taps and online tenders. For the first time since 2011, QTC issued floating rate notes (two maturities) in response to investor demand. QTC’s Australian dollar benchmark bonds remained the cornerstone of its funding activities and in April, QTC lengthened the profile of its curve by issuing a new benchmark bond line maturing in 2025. This line was issued with 144A capability and, as a result, a number of US-based investors participated in the primary transaction. In the period under review, QTC delivered a lower borrowing cost for the State, as bond spreads narrowed significantly; contracting, on average over the year, by 0.40 percentage points against Australian Government bonds and 0.30 percentage points to the benchmark swap rate. In addition to providing its clients with a lower cost of funds, QTC also used its financial markets expertise to reduce transaction costs by further aligning debt issuance with client drawdowns, and to provide quality assurance of the risk analysis and pricing for public private partnerships. QTC continued to offer a range of products that enabled clients to maximise the value of their surplus funds. This past year, QTC’s Capital Guaranteed Cash Fund outperformed its benchmark, the UBS Australian Bank Bill Index, by 0.80 percentage points and was ranked number one in the CPG Research & Advisory Pty Ltd performance report. the completion of 30 credit reviews of Government-owned corporations and local governments for Queensland Treasury and Trade and other shareholding departments to support their funding determinations. In addition, QTC provided significant support for the Projects Queensland initiative within Queensland Treasury and Trade, with the secondment of 14 specialist staff. QTC employees within Projects Queensland are leading the evaluation and procurement of some of the State’s most important infrastructure and service delivery initiatives to achieve value-for-money outcomes, deliver projects within tight time frames, and enable an appropriate transfer of risk to the private sector. QTC was also appointed to conduct the pre-work and preliminary due diligence activities for the Government’s proposed assets transactions initiative; the ‘Strong Choices Draft Plan’, which proposes to sell some assets, lease others and introduce an innovative option of private sector participation. While the Government will seek a mandate from Queensland voters at its next election before any divestment occurs, the completion of this work will help ensure that transactions are able to be completed in a timely manner, should the Government be given the mandate to proceed. QTC’s role in equipping clients with specialist financial knowledge and capabilities was expanded during the year, with the development and implementation of a range of new financial education courses tailored to meet the strategic needs of clients and support the Government’s renewal and contestability initiatives. In 2013-14, more than 700 employees from more than 50 of its client organisations participated in QTC’s targeted and tailored education program. QTC is now working with the Public Service Commission’s Commission of Audit (CoA) Implementation Team to develop and implement a financial skills training strategy for the Queensland Government workforce, as recommended by the CoA. QTC’s mature, strong and well-understood risk management culture is supported by its firmly established enterprise-wide risk management program, and provides the foundation for all corporate activities. In the year under review, QTC implemented an assurance framework for internal controls, identifying the organisation’s most important internal controls across all functions. The framework provides for periodic assurance from management—as well as independent assurance providers, such as internal audit—that each control is operating effectively. Significant progress was also made towards the improvement of our tools and applications for managing market risk, credit risk and collateral for derivative transactions. This included initiatives to centralise market risk data to ensure data consistency across reports and improved visibility of business logic, which has further increased QTC’s capability to measure market risk. QTC’s managed its portfolio market risk exposures, including interest rate, foreign exchange and counterparty risk, within Board-approved risk parameters. It also managed its financial markets risks in line with industry best practice and Basel Committee recommendations. In line with its internal and external policies, QTC continues to hold a portfolio of diverse, liquid financial securities to meet the State’s liquidity requirements. In the year under review, significant priority was placed on the identification and implementation of opportunities to improve the efficiency and effectiveness of operations. Planning is also underway for the longer-term strategy to ensure sustainability in our products, processes and systems, with a particular focus on the opportunities available in the changing technology environment. To support this, QTC restructured its information technology team to better enable it to respond to QTC’s corporate requirements, and established a division to ensure that all change initiatives align with QTC’s strategic and corporate direction and to provide support for the successful implementation of change projects. The focus on entrenching a high-performance culture within the organisation continued, centred on activities to enhance the agility, capability, capacity and engagement of QTC’s workforce. With a KPI to ensure a positive trend, staff engagement rose to 60 per cent, an increase of eight percentage points on last year and three percentage points above target. The result was supported by leaders championing the organisational agenda and by all employees participating in action workshops to remove barriers and develop solutions. A Talent, Succession and Promotions framework was introduced with the objective of retaining, developing and most effectively deploying key talent. Succession planning focused on developing strong talent pipelines for key leadership and business-critical roles. A Leadership Development Program was delivered, enhancing leaders’ skills in conducting high-performance conversations and coaching. In parallel, accountability and responsibility was pushed down through the organisation through a review of HR policies, to enable greater delegation, and empowerment in decision making, for our leaders. A cross-organisation learning and development council was established to guide the delivery of technical and transferable skill training. QTC’s inaugural employee recognition program—the Chief Executive’s Awards—was launched. A new remuneration framework, along with updated position descriptions, was implemented to foster high performance. The new framework is more transparent, easier to understand and more effective in driving robust performance conversations. Strategic workforce planning was undertaken to forecast future demand for resourcing and capability mix across the business. QTC continued its practice of regularly reviewing and updating its policies and procedures to comply with changes in the legislative and regulatory environment and to ensure employees have access to avenues through which to raise concerns, including an internal grievance process. QTC employees are employed under individual employment agreements, which adhere to the legislated provisions of theFair Work Act 2009. QTC is committed to maintaining high standards of corporate governance to support its strong market reputation and ensure that organisational goals are met and risks are monitored and appropriately addressed. QTC’s corporate governance practices are continually reviewed and updated in line with industry guidelines and standards. The Board comprises directors who are appointed by the Governor-in-Council, pursuant to section 10(2) of the QTC Act, with consideration given to each Board member’s qualifications, experience, skills, strategic ability and commitment to contribute to QTC’s performance and achievement of its corporate objectives. QTC’s Board is entirely constituted of non-executive directors. To ensure continuous improvement and to enhance overall effectiveness, the Board conducts an annual assessment of its performance as a whole. 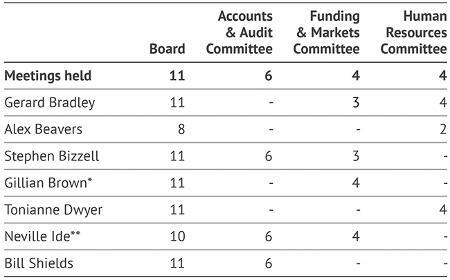 Board members’ remuneration is determined by the Governor in Council (details are disclosed in QTC’s financial statements). During the year the Accounts and Audit Committee recommended the adoption of the half year and annual financial statements, reviewed external and internal audit reports and the progress in implementing the recommendations from those reports, and reviewed the Queensland Audit Office’s Client Service Plan and QTC’s Internal Audit Plan. The Human Resources Committee must have at least two members and meet at least four times a year. The Human Resources Committee has observed its terms of reference. In February 2014, the Funding & Markets Committee reviewed its Terms of Reference. The amendments reflect the refocus of the Committee away from an operational review of funding and pool performance towards a focus on assisting the Board to consider the performance and risk management of QTC’s funding and markets activities. The core responsibilities of the Committee is to assist the Board by making recommendations about the policy to enhance the performance and management of risk in the areas of funding accessibility (including liquidity), and pool performance and to support QTC’s risk appetite with a focus on effectiveness and performance. The Committee must have at least three members and meet at least four times a year. The Funding and Markets Committee has observed its terms of reference. The LTAAB holds meetings at least four times per year and held five in the year under review. The LTAAB members are appointed by the Governor in Council, pursuant to section 10(2) of the QTC Act. 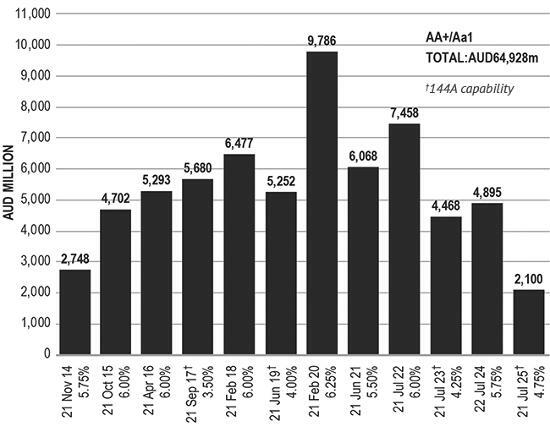 In the 2013-14 financial year, the Queensland Audit Office (QAO) audited controls and conducted some substantive testing of QTC’s systems used to complete the half year and full year annual financial statements. The QAO raised five low-rated issues that have been considered by the Accounts and Audit Committee, and addressed. The responsibility for the day-to-day operation and administration of QTC is delegated by the Board to the Chief Executive and the Executive Management Team. The Chief Executive is appointed by the Board. Executives are appointed by the Chief Executive. As with the Board, all Executive Management Team appointments are made on the basis of qualifications, experience, skills, strategic ability, and commitment to contribute to QTC’s performance and achievement of its corporate objectives. Mr Bizzell currently holds company directorships on a number of ASX listed boards including Armour Energy Ltd, Diversa Limited, Laneway Resources Ltd, Renascour Resources Ltd, Stanmore Coal Ltd, and Titan Energy Services Ltd.
Ms Brown has advised government bodies on a number of project and transactional arrangements and has an in-depth knowledge of the mechanics of government and its objectives. Ms Brown is a director of the Australian Rail Track Corporation Limited. She has held senior roles with Harnbros Bank Limited and Societe Generale and was an Executive Director of Quintain Estates & Development PLC. Ms Dwyer currently holds directorships on DEXUS Property Group, DEXUS Wholesale Property Fund, Cardno Limited and Metcash Ltd and is appointed to the Senate of the University of Queensland. From 2010, Mr Ide has served on a number of boards and provided financial risk management advisory services. He is also a non-executive director of RACQ Insurance Ltd, Queensland Motorways Pty Limited, Queensland Police Credit Union Ltd and Public Trust Office Investment Board. QTC has an intrinsic link with the State of Queensland, as all of its obligations with regard to debt securities and derivatives are unconditionally guaranteed by the Treasurer of Queensland on behalf of the State Government. Since 1988, QTC has funded the Queensland Government’s public sector capital works programs and remains an important part of Queensland’s economic growth story. QTC continues to maintain a high-quality asset portfolio of public sector loans and investments, with a loan portfolio covering 174 Government clients — all underpinned by Queensland’s AA+/Aa1 credit rating. In December 2013, QTC revised its original $12.1 billion 2013-14 estimated borrowing program down to $11.1 billion as a result of better operating performance in the general government sector, lower borrowing requirements across government and the deployment of surplus liquidity. The target borrowing program was achieved by 30 June 2014, with funds borrowed from global markets used to refinance maturing debt, as well as meet the new funding requirements of QTC’s clients—Queensland Government public sector entities—for their additional capital expenditure requirements. In the Australian fixed income sector, QTC outperformed its peers with a significant narrowing of bond spreads over the year. On average, spreads contracted by 0.40 percentage points compared to Australian Government bonds and 0.30 percentage points to the benchmark swap rate. To lengthen QTC’s debt maturity profile, and provide investors with a maturity in each calendar year out to 2025, QTC issued $1 billion of a new AUD denominated benchmark bond maturing in July 2025. A further $1 billion was tapped via syndication a month following the primary issuance. Investors viewed both of these public issues favourably, evidenced by the diversity of investor type and geographic distribution. Having US Rule 144A capability imbedded into QTC’s AUD domestic benchmark bond program continues to see an increased participation from the US market in primary market issuances. While AUD benchmark bonds remain the cornerstone of QTC’s funding program, QTC also issued two benchmark-sized floating rate notes maturing in 2016 and 2017 respectively in response to investor demand for floating rate note instruments at the shorter end of the curve. 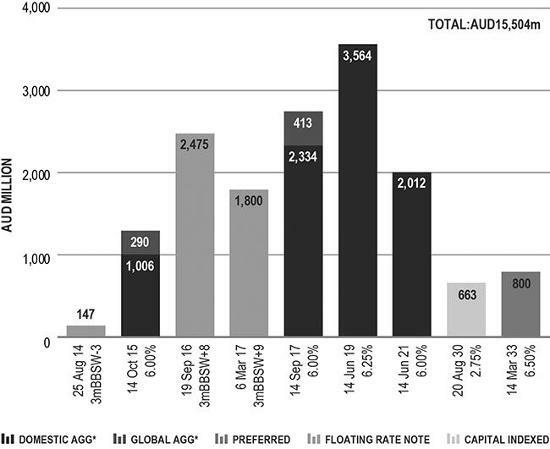 These were the first floating rate instruments QTC had issued since 2011, and by year-end, aggregate outstandings were valued at more than $4 billion. To complement its term debt issuance, QTC also maintained approximately $5 billion of commercial paper outstandings throughout the year under its Domestic Treasury-Note and US and Euro Commercial Paper programs. In August, more than $4 billion of QTC term debt matured in both the benchmark bond program and QTC’s Australian Government Guaranteed bonds. QTC’s Fixed Income Distribution Group (FIDG) comprising fourteen global and domestic banks act as QTC’s intermediaries in debt capital markets by supporting secondary market activity, as well as primary market issuance. As in previous years, QTC continued to work closely with its FIDG members to broaden its global investor base to support liquidity across its benchmark lines. Turnover of benchmark bonds during the year increased from the previous period. QTC values its diverse, global investor base, estimating that almost half of its investors are domiciled in offshore jurisdictions. To help market participants stay up-to-date with QTC’s funding activities, investors can now subscribe to receive quarterly funding updates, market announcements for all public issues, as well as relevant market information about Queensland and QTC. In 2013-14, Queensland/QTC maintained its Aa1/P1/Negative and AA+/A-1+/Stable credit ratings from Moody’s Investors’ Service and Standard & Poor’s respectively. In June 2014, both rating agencies affirmed their ratings following the 2014-15 Queensland State Budget release. QTC continued to build its AUD yield curve during the year by issuing a new benchmark bond with US Rule 144A capability maturing in 2025. QTC issued two benchmark-sized floating rate notes maturing in 2016 and 2017. * Australian Government Guaranteed Note: The 20 August 2030 Capital Index Bond outstandings do not include indexation of $171.3 million. The 19 Sep 2016, 06 Mar 2017 and 19 Nov 2018 FRNs all carry 144A capability. In 2009 QTC accepted the offer of a guarantee from the Australian Government (in addition to the guarantee provided by the Queensland Government) as a result of the global economic and financial crisis. All remaining benchmark bond lines under this guarantee will remain covered until maturity or retirement. These bonds are rated Aaa/AAA by Moody’s Investors Service and Standard & Poor’s respectively. The Guarantee was closed to new issuance after 31 December 2010. Through its Fixed Income Distribution Group, QTC offers investors the opportunity to switch Australian Government Guaranteed AUD bonds into equivalent AUD benchmark bonds. During the year, investors chose to switch $5 billion into QTC’s AUD benchmark bonds. QTC is the largest sub-sovereign Australian fixed income issuer. QTC provides investors with a choice of 12 benchmark bonds, ranging in maturity from 2014 to 2025. QTC works closely with its Fixed Income Distribution Group to actively support secondary market activity in its bonds. Following the release of Queensland’s 2014-15 State Budget on 3 June 2014, QTC announced its estimated 2014-15 borrowing program to be $13 billion: $8 billion term debt and approximately $5 billion of short-term debt (primarily commercial paper). QTC expects to fund its term debt issuance by supporting liquidity in its benchmark bonds, which will continue to remain QTC’s principal source of funding. QTC will consider further issuance of floating rate notes, and issuance will be targeted to smooth the benchmark bond maturity profile. Investors will again be offered the opportunity to switch Australian Government Guaranteed bonds into QTC’s AUD benchmark bonds guaranteed by the State of Queensland. As part of the Queensland State Budget release, the Government announced a ‘Strong Choices Draft Plan’ of asset transactions – including sale, long-term leases and private sector participation. The final plan is expected to be announced in September 2014 and the Government has indicated that this plan will form part of its policy agenda for the next State Government election expected in early 2015. The Government has made it clear that no assets will be sold or leased prior to a mandate being obtained at the election. As a result, QTC’s 2014-15 borrowing program does not take into account any proceeds from potential asset transactions. QTC will continue to keep the market informed on any outcomes relating to the proposed asset transactions and impact on its funding requirements. *Numbers are rounded to the nearest $100 million. #Other entities include: retail water entities, universities, grammar schools and water boards. Note: Funding activity may vary depending upon actual client requirements, the State’s fiscal position and financial market conditions. Australia is one of only eight countries globally rated AAA/Aaa/AAA with a stable outlook from all three major credit ratings agencies. A digital version of QTC’s investor booklet is available for iPad users from the iTunes store. QTC also offers investors the ability to subscribe to quarterly funding updates in English, Japanese, as well as Modern Chinese and Traditional Chinese. QTC’s Fixed Income Distribution Group is committed to providing investors with two-way bond pricing in the secondary market, as well as supporting primary issuance activities. During the year, QTC continued its compliance with the provisions of the Public Records Act 2002, and its implementation of theInformation Standard 40: Recordkeeping and Information Standard 31: Retention and Disposal of Public Records. QTC has continued its work with State Archives on the development of a QTC-specific Local Retention and Disposal Schedule, and provides training to staff in the appropriate management of public records in all formats, including email. During the year, QTC’s record keeping systems and capabilities largely continued unchanged. QTC is investigating the procurement and implementation of an electronic document management system for implementation in the 2014-15 year. The total remuneration payments made to the members of the QTC Capital Market Board was $391,233 and the total on-costs (including travel, accommodation, and hiring of motor vehicles for the members) was $45,961. No payments in relation to remuneration or on-costs (including travel, accommodation, and hiring of motor vehicles for the members) were made to members of the Long Term Asset Advisory Board in the year ending 30 June 2014. The related entities in Note 30 (except Sunshine Locos Pty Ltd) are consolidated into Queensland Treasury’s financial report. Queensland Treasury Corporation’s annual and half-yearly reports (ISSN 1837-1256 print; ISSN 1837-1264 online) are available on QTC’s website. If you would like a copy of a report posted to you, please call QTC’s Corporate Affairs group on +61 7 3842 4685. Download QTC’s dealer panels contact list (as at 30 June 2014) (PDF). Download QTC’s issuing and paying agents contact list (PDF). QTC is committed to providing accessible services to Queensland residents from culturally and linguistically diverse backgrounds. If you have difficulty understanding this report, please contact QTC’s Corporate Affairs group on +61 7 3842 4685 and we will arrange for an interpreter to assist you. In accordance with the Annual report requirements for Queensland Government agencies: Requirements for the 2013-2014 reporting period, with which we have to comply under the Financial and Performance Management Standard 2009, QTC publishes details of its annual expenditure on consultants and overseas travel. The compliance checklist outlines the governance, performance, reporting and other specific requirements for annual reports in accordance with the Annual report requirements for Queensland Government agencies: Requirements for the 2013-2014 reporting period.